The labels are preferably applied to the front or back. Labeling from top or from the side is possible. The pad is positioned in front of the peel-off plate. The label is held during printing. The rotary cylinder applies the label on the packaging. A sensor detects the packaging and, when labeling has finished, moves back the pivot arm and pad to their initial position. Labels are precisely tamped on plain surfaces, even recessed. The spring-mounted suction plate allows labeling on inclined surfaces up to 15°. Deviation in height in the area of the label may not exceed 10 mm. With 5 to 10 mm distance to the product surface, air jet blows the labels onto the product. We show you features and benefits. Designed for fully-automated print and apply processes in production lines. Why are the Hermes print and apply systems in automated manufacturing processes that successful? 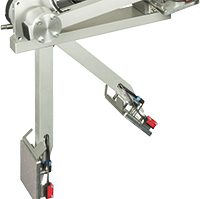 Pivot arm length is defined as the accessible 90° label position (lower edge of the label) below the footprint of Hermes+. supporting with air. To assist the label transfer, the label is blown from below to the pad. Delivery includes a fine filter, pressure control valve, pressure display, a hose to be connected to the applicator's compressed air input and material to assemble to the chassis or bracket. In case the labeling system is part of a plant, compressed air supplying the applicator can be switched on or off. 3D models for this applicator in STEP format you can find in documentation to Hermes+. We offer Hermes+ 3D CAD models with different applicators in stp file format. Well-trained cab service engineers worldwide support in the maintenance and repair of the devices.